Pilot chutes of diameter of 725 or 825 mm made of ZP (zero air permeability) are used for general purposes. 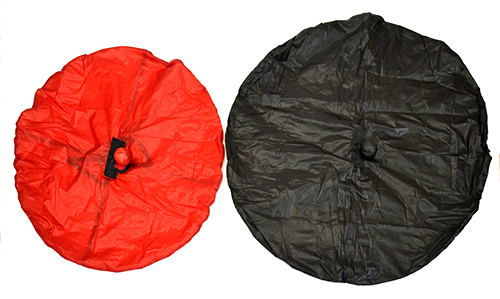 Pilot chutes in diameter of 825 and 925 mm made of ZP or F-111 (reduced air permeability) are used when stronger drag is needed: for wingsuiters, for swoopers who open under the tail of the aircraft in subterminal speed, and for skydivers who use large and heavy canopies like students or accuracy jumpers. By a special request we manufacture the pilot chutes of these and other sizes with the netting of higher permeability (High Drag Netting). 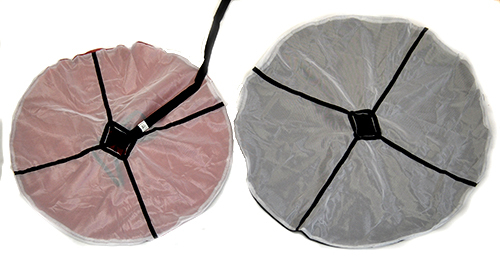 The netting allows accelerate the air-inflation process and to slightly increase the drawing force at equal conditions. This may be essential if a canopy manufacturer requires Pilot chutes of non-standard small size.